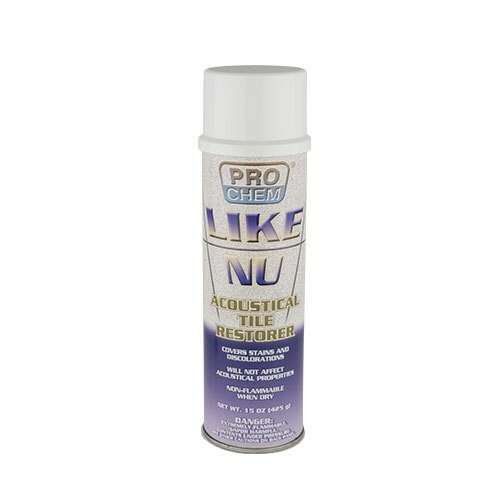 LIKE NU | Pro Chem, Inc.
LIKE NU restores stained and discolored ceiling tile to like-new condition, eliminating the need for costly replacement. This product is excellent for both smooth and rough surfaces. It is in compliance with fire and building codes. After spraying, the dry residue is nonflammable and will not burn. LIKE NU features an interchangeable actuator system that allows spraying of tiles while they are in place or when they have been removed. Removes stains caused by water damage, smoke, and soil. Unlike paint, LIKE NU does not change the acoustical properties of the ceiling tile. Surface Preparation: Remove loose dust and dirt by wiping tile gently with a dry rag or duster. Cover surfaces under area to be treated with newspaper or a drop cloth. Protect other areas with masking tape. Tile must be dry. Leaks which have caused water stains must be repaired prior to application. Directions: SHAKE VIGOROUSLY BEFORE AND DURING USE. Replace button with large vertical action actuator for application on installed tile. When possible, remove tiles to a well-ventilated area before application. Shake can vigorously until agitator ball rattles freely. Continue shaking for at least one minute. Hold can 8 to 10 inches from tiles to be coated. Apply with a sweeping motion using several thin coats. Allow each coat to dry for at least two minutes before applying next coat. IMPORTANT: After application, clean valve by turning can upside down and applying short burst to clear actuator.